Our Body Corporate Services make organising annual Pest Control and Termite Inspections a breeze. Unit and Apartment Complex Managers can now rest easy. With Certified Home Inspection's Body Corporate Services. Also Our new Active Calendar gives Unit & Apartment Owners or Tenants. the power to organise their own appointment time. Which is convenient to them. Once our friendly office staff get the required information. Then each unit holder will be emailed an active schedule. where they can see the times and days available to them. When organising your appointment you even get the opportunity to pay for it online and be emailed a receipt and a confirmation of your appointment time. It is really that simple. Also Our trained, licensed and certified technicians will then go about conducting the Termite Inspections. and/or Pest Control Treatments. Additionally we do all common areas, car parks etc. The day you have the Termite Inspection on your Unit is the day you get your Termite Inspection Report emailed to you. Our digital reports are full of information and include photos of problem areas. The photos included will be from our High Resolution Digital Camera. and/or our Thermal Imaging Camera depending on the issue found. Furthermore Another service we offer is General Pest Control. 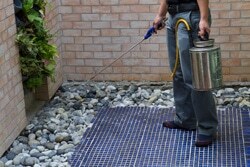 which is a pest control treatment that targets Cockroaches, Silverfish, Spiders and Ants. Additionally We strongly believe that a yearly treatment is most effective. As it breaks breading cycles. All chemicals used are family and pet friendly. Also other services we offer are mosquito treatments. In fact the treatment will give you relief for up to six weeks. Also we offer Rodent Control. (Mice & Rats) to units and apartments or body corporate areas like garbage collection bays. At Certified Home Inspections can offer very cost effective prices. This is because of the volume of units that need to be serviced in the whole Apartment or Unit Complex. By not having to travel between jobs. we can pass those savings onto customers. We can meet with Committee Members. And Strata or Complex Managers to have a walk through and give a free quote. Also all our services come with a warranty . So this will give you confidence you are getting the best possible service. For maximum ease we have a range of payment options available for customers. For safety reasons we do not accept CASH payments given to the technicians on the day. What happens if Active Termites are found? When finding Termites anywhere. it is important not to further disturb them. So We can treat them onsite with a safe and effective chemical which will destroy them. In fact The most important thing is good contact with the chemical on the Termites. So then they can potentially take it back to the nest.